Dark energy, the mysterious substance thought to be accelerating the expansion of the universe, almost certainly exists despite some astronomers' doubts, a new study says. After a two-year study, an international team of researchers concludes that the probability of dark energy being real stands at 99.996 percent. But the scientists still don't know what the stuff is. 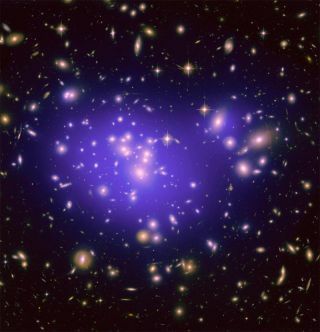 "Dark energy is one of the great scientific mysteries of our time, so it isn’t surprising that so many researchers question its existence," co-author Bob Nichol, of the University of Portsmouth in Engalnd, said in a statement. "But with our new work we’re more confident than ever that this exotic component of the universe is real — even if we still have no idea what it consists of." But in 1998, two separate teams of researchers discovered that the universe's expansion is actually speeding up. In the wake of this shocking find — which earned three of the discoverers the Nobel Prize in Physics in 2011 — researchers proposed the existence of dark energy, an enigmatic force pushing the cosmos apart. Still, not all astronomers are convinced that dark energy is real, and many have been trying to confirm its existence for the past decade or so. One of the best lines of evidence for the existence of dark energy comes from something called the Integrated Sachs Wolfe effect, researchers said. In 1967, astronomers Rainer Sachs and Arthur Wolfe proposed that light from the cosmic microwave background (CMB) radiation — the thermal imprint left by the Big Bang that created our universe — should become slightly bluer as it passes through the gravitational fields of lumps of matter. Three decades later, other researchers ran with the idea, suggesting astronomers could look for these small changes in the light's energy by comparing the temperature of the distant CMB radiation with maps of nearby galaxies. If dark energy doesn't exist, there should be no correspondence between the two maps. But if dark energy is real, then, strangely, the CMB light should be seen to gain energy as it moves through large lumps of mass, researchers said. This latter scenario is known as the Integrated Sachs Wolfe effect, and it was first detected in 2003. However, the signal is relatively weak, and some astronomers have questioned if it's really strong evidence for dark energy after all. In the new study, the researchers re-examine the arguments against the Integrated Sachs Wolfe detection, and they update the maps used in the original work. In the end, the team determined that there is a 99.996 percent chance that dark energy is responsible for the hotter parts of the CMB maps, researchers said. "This work also tells us about possible modifications to Einstein’s theory of general relativity," said lead author Tommaso Giannantonio, of Ludwig-Maximilian University of Munich in Germany. "The next generation of cosmic microwave background and galaxy surveys should provide the definitive measurement, either confirming general relativity, including dark energy, or even more intriguingly, demanding a completely new understanding of how gravity works," Giannantonio added. The team's findings have been published in the journal Monthly Notices of the Royal Astronomical Society.